Home » Investment » How to Find Best Child Education Investment and Saving Plan? I want to invest money for child education and marriage. He is 1-year-old. Please suggest some best child education and saving plan. This question was asked on Zee News program “Money Guru” recently. An advice given by expert was purchase term plan and invest in child plans like ICICI Childcare plan and HDFC Child gift fund. Well, it was very easy for an expert to identify and advice on Best Child Education Investment and Saving plan. However, do you think that this advice is making sense? Rather than making an investment on ad-hoc basis based on advice by so-called expert, it is better to put a plan in place to meet your child education need. In this post, I will try to show you approach that can be used to identify Best Child Education Investment Option. Why it is important to plan for child education? The cost of education is skyrocketing in India. It is a big reason to worry for the middle-class parents. Data shows that fees of premier institute IIT for engineering have increased by five times in last 10 years. IIT (B.Tech) fee was 2.28 Lakh in 2008 and now it is 10 Lakh. 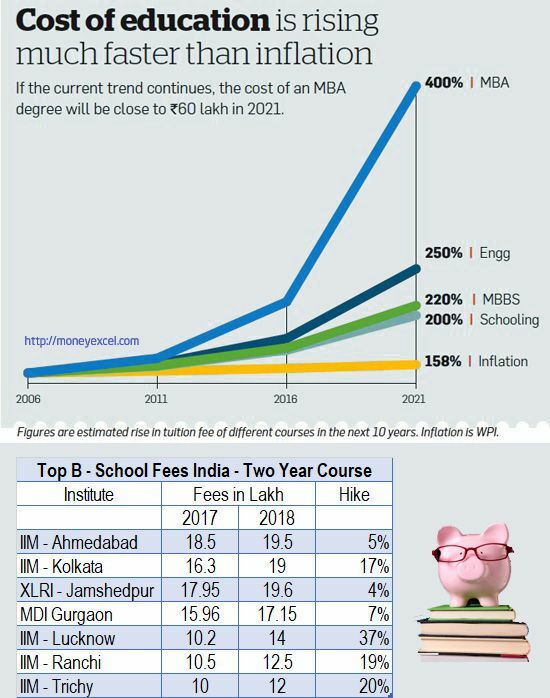 Similarly, fees of IIM for PGP course has nearly doubled. A fee of PGP course in IIM Ahmedabad was 11.5 Lakh in 2008 and today it is costing 19.5 Lakh. Forget premium institute like IIM and IIT, an average fee of Engineering course is roughly Rs 6 Lakh today, five years down the line it would be close to double meaning Rs 12 Lakh. In 10 years’ time, it’s likely to cost around Rs 20 Lakh. The growing cost of education has no dead end. The options left with you succumb to the situation by taking education loan or plan for child education. First step is to plan for higher education program. Identify two-three good career options for your child. I know it is difficult to zero down to education option at this stage. Still, for the planning purpose select career option based on your wish and your child interest. The second step is to find out target year by when you are likely to spend this money. It is very easy to find out this. If your child age is 1 year then he will enter in graduation year after 18 years. This means if you are planning for engineering target age would be 18 years. If you are planning for MBA after graduation target age would be 22 years. Now based on education option selected by you try to find out current cost. It is very easy to find this cost. First decide educational institute and location where you are planning education of your child. You have various options such as government college, self-finance collage, deemed university, REC, IIT etc. Now find out current education cost applicable to course and institute. You can get this information from website or from institute itself. Next step is to find future education cost. It is very difficult to predict future education cost. There are various methods to do so. First is consider roughly 8-10% inflation every year and find out future education cost. Another method is use simple excel formula of FV (Future Value). If you are not familiar with excel you can use following formula to calculate future value. Now discover yearly or monthly investment amount required for reaching the target amount. It is a difficult exercise and you need to assume expected returns from investment options where you will be investing money. You can use simple excel formula PMT for doing this. PMT is a financial function that calculates investment required for an option based on constant payment and constant rate of return. It may not be a full proof method but you can get an idea about the amount required for investment. You can use simple calculator developed by us for calculating child education cost. Once you are done with above exercise, you need to find out investment option which can generate a return as per your expectation. I suggest not to invest in fixed deposit, term plan or ULIP for child education. As per me, a mutual fund is one of the best investment options for child education planning. You should select 2-3 good equity oriented mutual funds and start SIP. Make sure you select mix of a large-cap and mid-cap fund for investment. Select the mutual fund with good historical return matching with your expected return. Keep on increasing SIP on your salary increment or on child’s birthday. If you are a high-risk investor you can try equity also. If you are a conservative investor and don’t want to invest in mutual fund. I would advise considering PPF as next investment option. PPF is a 15-year scheme that helps you to generate tax –free corpus for your child education. You can partially withdraw money from PPF account after the sixth year and you can close the account after 15 years. However, please note that expected return of PPF is lower compared to mutual funds. Start Investment at an early stage. It is easy to achieve the target if an investment is started at an early stage. Power of compounding plays an important role when it comes to investment. Select best investment options with higher returns. Track your portfolio at regular interval and make appropriate changes. Select Tax efficient investment options. Don’t invest in fixed deposit. Also, avoid endowment plan or money back plan. The expected return of these type of plans is nearly 6-7%. Make sure to create a separate portfolio for child education. Identify and tag fund or portfolio. This will help you for tracking the performance of the fund. In the end, I would like to say that don’t invest your money blindly. Invest only if you are sure about investment scheme and returns.